For his fourth film, following Brother Tied, Blue Valentine and The Place Beyond The Pines, writer-director Derek Cianfrance has gone all out for his biggest and most emotionally ambitious feature yet. The Light Between Oceans, adapted from M.L. Stedman’s novel of the same name, features powerhouse drama at its core which only someone like Cianfrance could make as devastating on the big screen as it is in paperback – however, it also represents a mild complacency for a filmmaker who previously took great risks in his storytelling and characterisation, and has made a decent film which may be too safe for its own good. 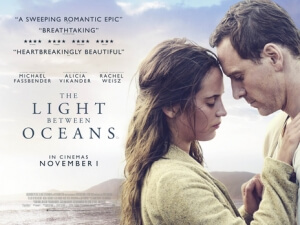 Much like the novel it was based on, the film follows Australia-based lighthouse keeper Tom (Michael Fassbender) and his wife Isabel (Alicia Vikander), who one day come across a rowboat with a dead man and a crying baby inside of it. Unable to conceive children of their own, the couple resolves to raise the baby girl as their own, but a moral dilemma emerges when Tom comes across a grieving woman named Hannah (Rachel Weisz), who lost her husband and infant daughter at sea, and realises that she is their adopted girl’s real mother. The way that Cianfrance paces the story is sometimes distractingly slow, so much so that it even takes about 30-40 minutes before they even come across the rowboat in the first place – or at least, it feels that long, because scenes are dragged out for longer than is probably necessary. It’s probably a tactic that works better in a novel, but when you’re adapting for the screen you have to make some changes to best suit a wider audience; there is no need to show us their entire courtship up to the moment they get married or even Isabel’s two tragic cases of miscarriage, but if you are going to do that then at the very least trim it down so that low-attention span audiences can get the gist of things quicker than it would seem when reading it in a book. Cianfrance keeps this type of pace going throughout the whole movie, and even when things start to come to a head in terms of its drama, it’s still unrestrained enough to seem long-winded and even indulgent. Problems with the logic that the characters seem to operate under often distract you from being fully sucked in to the drama. For instance, upon discovering the baby for the first time, Tom finds a unique rattle that he keeps for the baby, and of course it becomes a major plot point later in the film, so from that you can sense that a lot of their problems could easily have been solved if a) he had just thrown the rattle away into the ocean, or b) he just put it back in the rowboat before setting it adrift again. It’s probably something originally written into the story for drama’s sake, but later in the film there are a few more contrivances that spring up from the situation and fall a little too neatly into place for everyone to come out of it as unharmed as possible. It’s a story that is definitely designed to bring out the emotions, which can sometimes mean bending the logic slightly to amount to something that can hit people where it hurts, but there are perhaps a few too many for even something as manufactured as this. That said, it is not even remotely close to being a bad film. It’s definitely got problems, particularly in its pacing and storytelling department, but at the same time it is an extremely well-made piece of drama. Cianfrance, despite dragging things out to an unnecessarily long length, still knits a tight chain of emotion as the devastating events play out, and keeps the tone relatively firm all throughout. It is also a very well-acted film, with Fassbender and Vikander – who became a real-life couple after shooting this film together – growing into their chemistry throughout the film while also giving solid performances of their own, and Weisz gaining sympathy for someone who could have very easily been written as a hysterical and fiercely protective rightful mother. Adam Arkapaw’s cinematography is also vivid and colourful, while Alexandre Desplat’s score may be melodramatic but hits the right notes at the right times. Even though it may not be Cianfrance’s masterpiece, The Light Between Oceans is still a decent-enough effort. The Light Between Oceans is a well-made and very well-acted drama, but it suffers from some severe pacing issues and certain logical choices that often distract from the emotionally-driven storytelling, which for writer-director Derek Cianfrance makes it perhaps his weakest film thus far.